Regular Mouth Plastic Storage Lids Ball Mason. Great tops that last a long time. Thanks Lauren, we also have the new Ball stainless lids in stock now as well! These plastic lids are good for after you open your preserved jams, sauces &amp; etc. Then you can put the plastic lid on &amp; put it in the fridge for easy access. I haven't used the products as yet but they arrived quite quickly and were exactly as ordered and in excellent condition. I hope to start using them in the next couple of weeks. 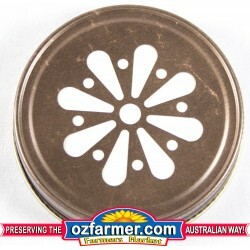 I was impressed with Ozfarmers and have just placed another $300 order with them. They are great also for using the bottles as storage jars. 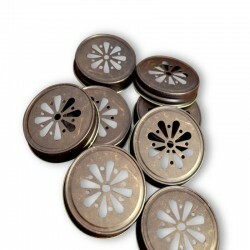 If you are needing extra sealing I use the used metal inserts, for preserving, with the plastic lids. Seems to work well. Bought these to go on Ball Mason Jars that I also bought. They fit well and are perfectly functional, just don't try to use them (with the jars) for secondary Kombucha brewing like I did, as they don't seal tightly enough on the jars. My mistake, but I will use them with the jars for plenty of other things. 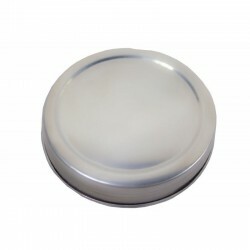 Ball Regular Plastic Storage Caps are ideal for storing or freezing with Regular Mouth Glass Preserving Jars. The versatile Ball Regular Plastic Storage Caps provide more ways to store your creations. You may refrigerate, freeze or store. Each package contains 8 reusable plastic storage caps. Not for use with the FreshPreserving process. Does not contain bisphenol A (BPA). Use Ball Regular Plastic Storage Caps for refrigerator storage after you open your fresh preserved foods. Ball Regular Plastic Storage Caps fit all Ball Regular Mouth Glass Preserving Jars. Store your dry goods in Ball Glass Preserving Jars. Lid Daisy Bronze Suits Ball Mason Regular Mouth Jars And Handle Jars Top Quality USA Made!Daisy ..
Lid Daisy Antique Gold Suits Ball Mason Regular Mouth Jars And Handle Jars Top Quality USA Made! ..
Lid Daisy Gold Suits Ball Mason Regular Mouth Jars And Handle Jars Top Quality USA Made!Daisy c..
12 x USA Made Daisy Lid Bronze Color Suits Ball Mason Regular Mouth JarsDaisy cut lids, are an ..
Reusable Stainless Steel Regular Mouth Lids for preserving fit all regular mouth glass preserving ja..
Reusable Stainless Steel Wide Mouth Lids for storage fit all ball wide mouth preserving jars.Fo.. 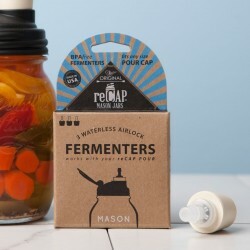 Originally designed to make, store and pour salad dressing directly from a Mason jar, ReCap lids len..
Flip, Shake and more - The reCAP FLIP opens to a LARGE 2"/5cm diameter and fits Regular Mouth Mason .. Introducing The reCAP® Fermenter: the EASIEST waterless airlock set that ferments and stores cu..
Ball plastic lid (BPA Free) fitted with grommet and supplied with sterilock airlock and optional upg.. These lids are an attractive single piece lid. Use on regular mouth jars. They can be used for proce..